The last GT3 pole position for a Silver crew also came at Silverstone 12 months ago, but this time it was all about RJN, Nissan, Ricardo Sanchez and Struan Moore who each claimed their maiden poles thanks to a supremely consistent performance. Former GT Academy winner Sanchez, making his British GT debut this weekend, set the ball rolling in the opening session against the class’ Am contingent. Mark Farmer, who took an individual pole last time out at Snetterton, came closest to toppling the Mexican after lapping within 0.7s, while Rick Parfitt Jnr’s Team Parker Bentley was another 0.2s further back. Graham Davidson, Andrew Howard and Ian Loggie completed the provisional top-six. Sanchez’s natural advantage over the Am drivers in Q1 is balanced by the extra ballast carried by Silver crews, which would make it tougher for Moore in the second session. However, a marginally faster time than his main rival – Farmer’s co-driver Nicki Thiim – helped the GT-R extend its advantage in the final standings to 0.714s. Instead of challenging for pole, TF Sport only just held on to second after Jetstream’s Maxime Martin lapped 0.5s faster than his AMR stablemate. Just 0.010s separated the two Aston Martins on the combined timesheets, while Callum Macleod’s rapid effort helped the #7 Team Parker Bentley vault from eighth to fourth. Team ABBA Racing’s Mercedes-AMG also picked up a couple of places thanks to Adam Christodoulou who lowered his own British GT3 qualifying lap record at Silverstone to 1m59.095s. Ryan Ratcliffe finished sixth in the second Team Parker Bentley he shares with Parfitt Jnr, Optimum’s Jonny Adam and Flick Haigh were seventh, and Howard and Darren Turner finished eighth in the Beechdean AMR V12 Vantage. Championship leaders Lee Mowle and Yelmer Buurman start 12th, the same position from where they won at Rockingham earlier this season. 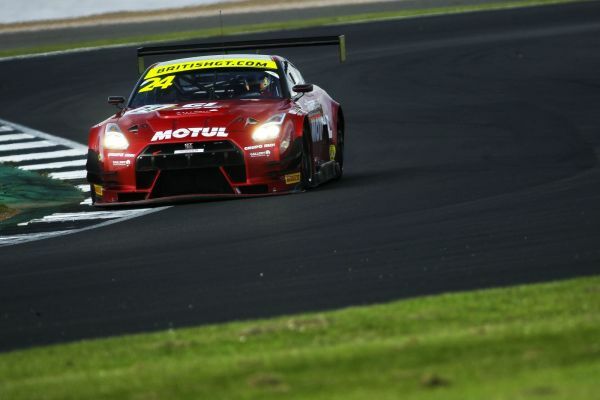 Struan Moore, RJN Motorsport #24 Nissan GT-R NISMO GT3: “We’re all really chuffed. Obviously it’s my first time racing with Ricardo [Sanchez] in British GT, so to get the pole together is pretty special, and especially as it’s with the older-spec Nissan GT-R.
British GT4 at Silverstone 500 - A sixth different winner in as many races ?